Study all the important Current Affairs from Current Affairs One-liners - 8th December 2017. 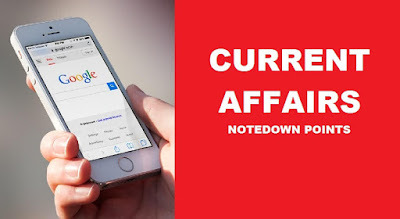 These Current Affairs One-Liners include all the important news updates related to Sports, Achievements, Recent Government Schemes which are very important for IBPS exams. Indian Bank revises interest rates on foreign currency non-resident deposits. ICICI Bank launches a digital service to allow customers to open a (public provident fund) PPF account via internet banking or mobile banking. Prime Minister Narendra Modi inaugurated the B R Ambedkar International Centre and said it would be an important place for research on social and economic issues. Border Security Force (BSF) launches computer-assisted test to examine psychological health of personnel. Amazon Web Services (AWS) has become the first global Cloud service provider (CSP) to achieve full empanelment for delivering Public Cloud services to government customers in India. Sushil Kumar quits as National Sports Observer for wrestling. The Somali government and the United Nations signed the UN Strategic Framework for Somalia (UNSF), mapping out the world body’s support to the country’s development priorities in the next four years. The State government of Andhra Pradesh and Make in India Korea Center (MIC) signed a Memorandum of Understanding (MoU) to set up Korea Industrial Complex in the State. India lifts first South Asian Regional Badminton Tournament at the Tarun Ram Phookan Indoor Stadium. EFPO stands for Employees' Provident Fund Organization. V. P Joy is the CEO of Employees' Provident Fund Organization. The head quarter of Employees' Provident Fund Organization is situated in New Delhi. Employees' Provident Fund Organization was founded in 1952. Indian Bank was established in 1907. The CEO of Indian Bank is Kishor Kharat. The head quarter of Indian Bank was established in Chennai. The head quarter of Axis Bank is situated in Mumbai. Sikha Sharma is the CEO of Axis Bank. Tajmahal is situated in Uttar Pradesh. The head quarter of UNESCO is situated in Paris. B R Ambedkar International Center is situated in New Delhi. The head quarter of Border Security Force is situated in New Delhi. Angkor Wat is situated in Cambodia.